The phoenix-like rise of eighties alternative-rock group Sunnyboys (1980 – 1984) continues with the announcement today of a brand new best-of collection and a headline tour, the band’s first since their one-off reformation in 1991. Sunnyboys Our Best Of is comprised of 16 tracks all remastered and hand-picked by the band and features the hits; fan faves and previously unreleased material including a pre-debut album demo; recently unearthed alternative mixes from their 1982 albun, Individuals, and a bonus live-track taken from Sunnyboys recent Vivid Live performance. Our Best Of will be released digitally and to CD via Warners reissue imprint Festival Records on December 6th 2013 with the CD package also including a 14 page booklet detailing the band’s rise, mysterious disappearance, and eventual return plus, for the first time, Jeremy Oxley explains the meaning behind those songs. The tour comes after 12 months of spordic live activity for Sunnyboys initiated in April 2012 by the Hoodoo Gurus and their Dig It Up! Invitational and culminating in a triumphant sold-out performance in June 2013 at the Concert Hall of the Sydney Opera House. More recently a documentary about the turbulent life of Sunnyboys singer / guitarist / songwriter Jeremy Oxley and his 30 year battle with schizophrenia toured around the country appearing at Palace Cinemas and airing nationally on ABC TV to a hugely emotional response. Kaye Harrison’s The Sunnyboy, tells a remarkable story of survival and the healing power of love as Jeremy finds his way out of the darkness (post-Sunnyboys) to reclaim his place with family and friends and ultimately the Sunnyboys. But all that is now behind them now. For Jeremy and the Sunnyboys the future holds so much more. “Of the hundreds of bands, and thousand of people that we knew at the time, we’re one of the few that can stand up and say “We were really good at what we did, and we’re really proud of what we did” and we’re lucky enough to still be able to get up and say to people ‘We’re really proud to be able to present this to you now'”. Richard Burgman Sunnyboys. The 2014 tour will take in shows in Byron Bay, Brisbane, Sydney, Melbourne and Adelaide and will feature support spots from Perth power-pop icons The Stems (heirs to the Sunnyboys crown in the 80’s), ex-Died Pretty frontman Ron S.Peno & The Superstitions, Geelong garage-punks The Frowning Clouds and local natives The V-Rays and The Windy Hills. Tickets for all venues will go on-sale Wednesday November 13th. Sunnyboys: Our Best Of CD / iTunes – released December 6th. The Sunnyboy DVD – released December 4th. 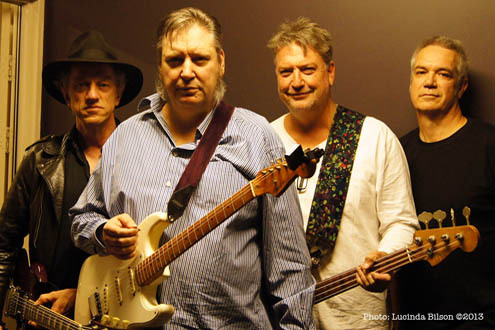 This is the Sunnyboys… alive and well in the 21st Century. But wait, that’s not all! Peter Oxley, bass-player for the Sunnyboys and a former Sydney restauranter with his own Wedgetail Woodfired Pizzeria, releases first ever cookbook this December. Entitled Teenage Kitchen Rampage, Pete’s cookbook is aimed at home leavers and the young and hopeless and hits all good book stores and online from early December. The book holds 45 recipes and is an easy guide for even the most inexperienced youth to develop a skill and love of home cooking. Teenage Kitchen Rampage released December 11th via Love Police.